I have now heard a few reactions from the first readers of News from Gardenia, I am more than thrilled to say they have, so far, been universally positive. I am collecting Tweets from people who have read the book but I’ve made one fatal error. In my enthusiasm I have collected the Tweets, but failed to record the Tweeter. If, by any chance you recognise the messages below please leave a comment and tell me your Twitter name and which message is yours and I will attempt to rectify the situation. 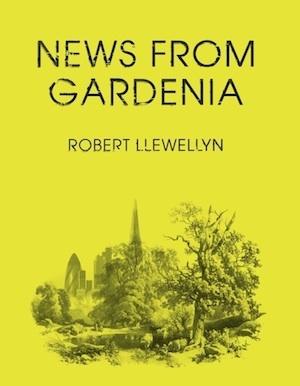 And if you are one of the billions of earth dwellers who hasn’t yet got a copy of News from Gardenia, you can still buy the hardback at Unbound. It will be available in July as a paperback just like any book. It’ll be in book shops and on Amazon etc, plus there will be Kindle/e-book versions and an audiobook. Loving News From Gardenia, @bobbyllew ! So glad to help make a hardbound copy possible. @bobbyllew The only problem with News from Gardenia was... it didn't last for ever! Amazing story! Thanks Mr Llewellyn! @bobbyllew Have started reading News From Gardenia. Loving it so far. @bobbyllew Loved NFG. Man arriving in the future's almost first thought "is sleeping with this woman cheating on my now dead wife?" Classic! @bobbyllew 3/4 through News From Gardenia and I'm torn. I don't want it to end, but I can't wait to finish so I can read it again! The last one is the only one I’ve remembered to record the Tweeters name. hashtag myfail.